Successfully Added THL Knight 1 Android Phone - 4G, Octa Core CPU, 3GB RAM, Fingerprint Scanner, Android 7.0, Dual Rear Camera, 4G SIM, OTG (Black) to your Shopping Cart. The THL Knight 1 smartphone is powered by a Mediatek MT6750 chipset and has 3GB of RAM making it a fantastic cheap phone with top-range specs and a lot of power. THL are famous for their great phone offerings and the THL Knight 1 the latest gen they have released. A sleek unibody design with 2.5D curved glass, front fingerprint scanner, and dual lens rear camera are easy in the eye and despite a large 5.5-inch screen, the thin body makes it comfortable for one hand usage. The phone is powered by an octa-core chipset that is clocked at 1.5GHz and with 3GB of RAM and a Mali T860 GPU it will easily cope with demanding apps, graphic intensive games, and serious multitasking without you experiencing any lag. The Knight smartphone runs on Android 7.0 (Nougat) out of the box so you're getting the latest flavor of Android OS with all the best features available including smarter data management, more intelligent Google assistant, and more efficient power management which will maximize your user experience while improving usage time. A 5.5 inch full HD IPS display will be sure to deliver all this in vibrant colors and vivid details. A 24-bit color depth and a pixel density of 401PPI mean you'll get a crisp display that's so enjoyable to view you'll find it hard to put down. 4G connectivity and dual SIM card slots offer great connectivity and will let you stream FHD content without the need for a Wi-Fi connection. The supported network bands bring 4G access to most of Asia, Africa, Australasia, and Europe as well as many Latin American countries so you can enjoy almost global coverage with the THL Knight 1 smartphone. On the rear of this phone is a dual lens camera setup, a feature normally reserved for flagship models is a nice touch. With a super aperture, the 13MP and 2MP camera deliver gorgeous lush images and the dual tone LED flash to ensure even low light shots will impress. A 3100mAh battery delivers respectable usages time that let you chat for up to 8 hours continuously. Other features include OTG, HotKnot, Gesture sensing as well as a fingerprint scanner for securing the phone and mobile payments. 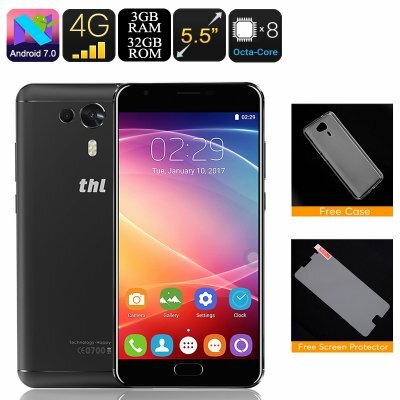 This THL Knight 1 Android Phone comes with 12 months warranty, brought to you by the leader in electronic devices as well as wholesale mobile phones and cheap phones.. Customer care service was prompt in answering questions and a pleasure to deal with every time. My package came on time without any delay and was up and running the minute I unwrapped it. Which I must say was well wrapped and safely packaged. The phone is not too light so that it feels too cheap but it is not bulky either. It looks great and the video quality is crisp and clean. Sound is great and the pictures come out beautifully. Setup was a breeze and this phone handled every thing I threw at it with ease. So after tons of installations and lots of game play, not to mention every feature has been turned on and in use , 3 days later I am still being blown away by the quality of this phone for the price I payed for it. Well done guys.